Echoing a sentiment that was one of the defining points of his hour-long speech to the world's financial and political elite at Davos, billionaire hedge funder (and supporter of far-left causes from Eastern Europe to the US) George Soros is taking his rhetoric a step further and calling for supranational governments to intervene and regulate Facebook, Google and other large social media websites. Per Breitbart, Soros is demanding that the European Union regulate social media because voters’ minds are being controlled and "manipulated". The platforms are similar to gambling companies (...) and force people to renounce their freedom (...). ...), to renounce what John Stuart Mill called the freedom of thought "
Soros - who recently became the subject of a "anti-Soros" bill in his native Hungary that seeks to limit the activities of groups that for which he's provided funding - accusations about manipulation are blatantly hypocritical, as anybody familiar with his 30-year campaign to push open borders, multiculturalism and a generally globalist tenor of government would know. Media websites and populist groups have been prolific on social media, using the platforms to bypass the mainstream media and broadcast their message - which Soros and his allies oppose - across world. 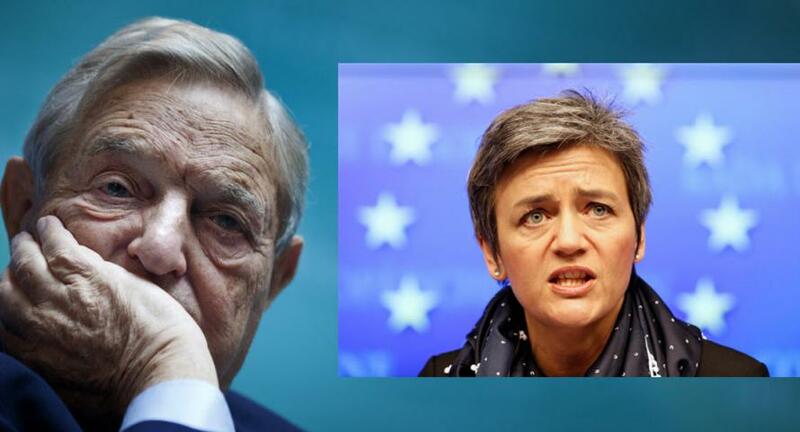 Soros has a cozy relationship with the leaders of the European Union, meeting with them 11 times since the Brexit vote. Prime Minister Theresa May, in contrast, has had just three meetings during that period. She has also mimicked Soros' call for responsible regulation of social media, but with the aim of suppressing terrorist recruiters. He then proceeded to cycle through a "greatest hits"-style mix of his favorite rhetoric: Europe is being overrun by the "mafia-state"-style leadership of Vladimir Putin, which President Trump would like to mimic, according to Breitbart. "In the US, regulators are not strong enough to stand up to the monopolies’ political influence. The EU is better positioned, because it doesn’t have any platform giants of its own," he continued. Mr. Soros, who has been convicted of insider trading, is also suspected of attempting to interfere in U.S. elections, and his name came up around 60 times in emails released by WikiLeaks relating to the recent presidential race. As we noted previously, the question arises: is Vestager adequately controlled by the European Parliament? "It could create an alliance between the authoritarian states and these big high-tech monopolies, in which the emerging control systems within the large corporations would be connected with the existing state regulatory agencies , This can lead to the emergence of a system of totalitarian control that even Aldous Huxley or George Orwell did not dream of. " Circling back to his widely lauded speech at Davos (which is something of an annual tradition), Soros touched on many topics, but his barbs against Trump drew most of the headlines. The octogenarian billionaire declared that Trump would be a "temporary" phenomenon, and predicted that Democrats would win overwhelming victories in 2018 and 2020. "I consider the Trump administration a danger to the world but I regard it as a purely temporary phenomenon that will disappear in 2020 or even sooner," he said. "The United States is set on a course towards nuclear war by refusing to accept that North Korea has become a nuclear power. This creates a strong incentive for North Korea to develop its nuclear capacity with all possible speed, which in turn may induce the United States to use its nuclear superiority pre-emptively; in effect to start a nuclear war in order to prevent nuclear war." And even as he dedicated nearly $20 billion of his fortune to his "Open Society" foundations last year, Soros' family office was busy investing in the fourth quarter after unwinding its modest Amazon stake, it added 2.47 million shares of Overstock or 9.9% of the outstanding stock worth $158MM, making him the third largest holder of the innovative online retailer. One wonders if Soros, aside from his political activities is becoming a believer in blockchain and bitcoin-supporting online vendors?